No licences that im aware of, they’re just a bit unglamorous, and are most prolific in places that don’t get modelled much - suburban London, south eastern, south central etc. GWR having them may make them a more compelling prospect. There are also huge intra-class variation, obvious cab front differences, but even within 377s, you’d need different tools to cover each of 377/1 and 3, 377/2 and 4, 377/5, and 377/6 and 7. And they are EMUs, and there have been very few recent EMU classes done as models - and where they have, some clearly didn't sell well as they were heavily discounted for ages (e.g. 350). The most recognisable EMU out there today is probably the Pendolino, but even that was done in N gauge by a small-scale producer after the main players had steered clear of it for years (Dapol said they were doing to do it, but never did). There is a very good 3D printed set on Shapeways. The Pendolino is a funny one, being 9 or 11 coach I think would have put the ‘big boys’ off, aside from Dapol’s land grabbing. I don’t think it’s necessarily in the same category as something like an Electrostar. Clearly Revolution showed there was demand though! I’ve never seen one of the Shapeways Electrostars built up, although I flirted with one. Not cheap by the time you’ve motorised it etc. 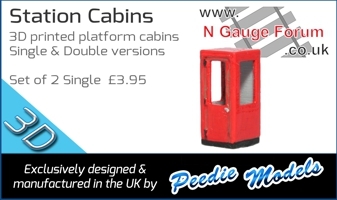 James Makin’s OO gauge ones look excellent. I'm pretty sure Ben has put something up about this before but the basics are that you need permission from a brand to use their copyright/trademark (where relevant) - that can be an exclusive or non-exclusive agreement. It helps massively if you can get assistance from manufacturers, owners or operators - again that can be an exclusive or non-exclusive agreement. The majority of agreements are non-exclusive but there are some exclusive arrangements. Some agreements involve royalties or "free" models but increasingly few. Even with the same company the position can change regularly.